Are you looking for inspiration for your next day out ahead of booking a minibus hire in Liverpool? There are a variety of activities for large groups to enjoy in Liverpool and the surrounding areas. From bouncing around an inflatable park to taking an educational tour of a national museum, there’s plenty to appease everyone. Here are a few of the activities we recommend for a fun minibus hire adventure. Show your friends who’s got the best skills at the all-new inflatable park in Widnes. 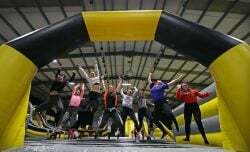 Originally a trampoline park, Velocity Widnes has recently transformed into one of the UK’s biggest indoor parks for inflatable fun. At Velocity there’s no limits on age, making it a superb destination for the whole family. Take a giant slide into a large ball pool, go wall climbing or engage in some Total Wipeout style action. This park is a fantastic venue for a minibus hire outing with accommodation for all kinds of groups including schools, fitness groups and even team-building exercises. 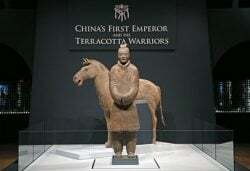 Have you ever wanted to see the world famous terracotta warriors for yourself? Well now you can! The spectacular artefacts are now on show at the National Museums Liverpool up until the end of October. Tickets are available to purchase including special bookings for schools and groups of 10 visitors or more. Don’t wait around for this one, grab your tickets now and book a minibus hire! No visit to Liverpool city centre would be complete without savouring one of the city’s most recognisable landmarks. 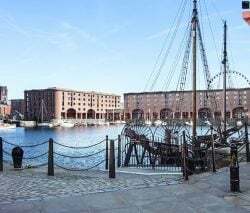 The Albert Dock is one of the best places to be during the sunny weather. Spectate a water activity, grab a bite to eat or unleash your child’s creativity at Mattel Play! Should you decide to order a minibus hire for this attraction, you will find many of Liverpool’s best features within walking distance. Decided on your next day out? Contact us to get started by calling 0151 922 4284 or emailing bookings@maghullcoaches.co.uk. You can also request a quote online – book your minibus hire in Liverpool today! Stay up to date on all the latest news and minibus hire information from Maghull Coaches by following us on social media. Leave a like on Facebook and stay tuned for more blog updates.